I was a little surprised by the number of people hiking up and out of Cedar Falls Valley as I was hiking in. Many were carrying cameras, and one said I was too late for the prism shots they’d gotten. I wasn’t disappointed. His comment let me know the sun was still striking the falls, so I stopped to take a few photos of a little stream next to the trail. I was wanting to arrive as the shadow of the valley covered the falls and made it possible to get even light. Pausing at this little cascade reminded me of many childhood hikes down this trail while listening to the water work its way toward Cedar Creek. I thought it was interesting to see this sign at Cedar Creek Bridge. I noticed some bowing in the bridge’s shape toward the downstream side, probably a result of recent high creek levels. This little bridge is pretty tough. When I arrived at the falls, crowds had thinned, and I was able to select a spot to hang out for a while. Since sunshine was still hitting the upper parts of the valley wall, I focused on the base of the falls and was pleased with these two hikers for adding a sense of scale. As the valley walls increasingly blocked the sun, I was able to enlarge the frame. I asked a young man who was rock hopping if he’d already been to the base of the falls. I mentioned that having someone there would add scale to my photos. He got excited about doing this, and I feared I was going to see him fall in the creek. A few minutes later he and a buddy were at the base. He didn’t realize I was using long shutter speeds. He never stood still, but that was reflective of his energy and enthusiasm. Energetic young man tossing limbs at the base of the falls as his buddy takes a picture. A few minutes later, he showed up at my camera and I was relieved to see he was still in one piece. I gave him my email, hoping to share a few of the waterfall photos with him. I enjoyed spending over an hour there at Cedar Falls and recommend a waterfall hike as a good way to welcome the new year. Notice the hikers to the left of the falls. This is a big place! Hiked up to a higher viewpoint for this shot before hiking out. Couldn’t resist taking a short video clip of Cedar Falls before heading out. Please forgive the jerky camera movement. I used my still camera and tripod for the shot. Hello, Where is Cedar Falls located? I googled it but didn’t find anything for Missouri. Thank you! 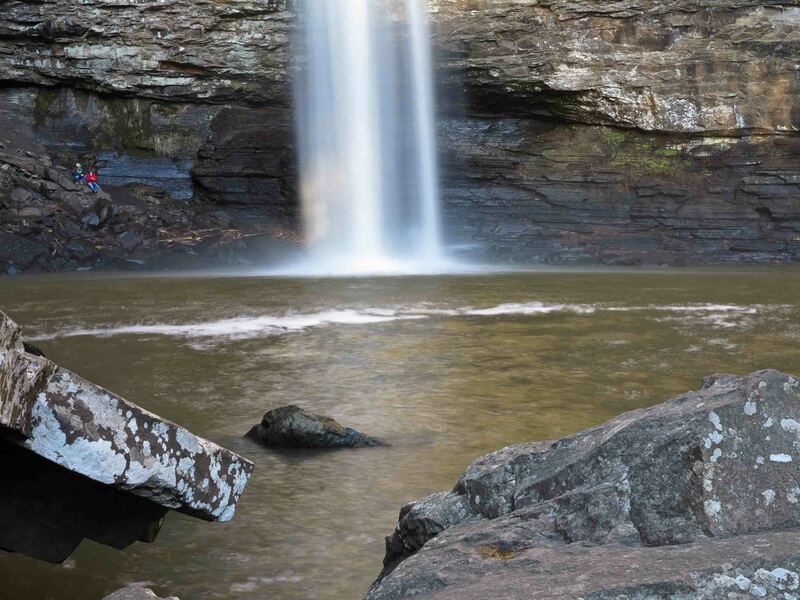 Cedar Falls is at Petit Jean State Park in Arkansas. Sorry I didn’t mention that important little piece of information. It is estimated to be 95-feet tall. One of my favorites and where I learned to love hiking as a child. Nice meeting you & thanks again for the photo you were able to take of Jess & myself. From one nature photographer to another, I envy your work! Happy New Year! Good to meet you on the trail. Thanks for reading!